The Craving Cure exposes the real reason so many of us can’t stick to a healthy diet: our favorite foods are engineered to be addictive. At her clinic in California, Julia and her colleagues treat food addiction where it starts—in the brain—by triggering our natural appetite-regulating neurotransmitters with nutrients called amino acids. It turns out that these protein concentrates boost our neurotransmitters, which broadcast sensations of satisfaction that no food, including chocolate, can override. Thousands of Julia’s clients have abolished their cravings for high-calorie confections using this simple nutritional strategy. 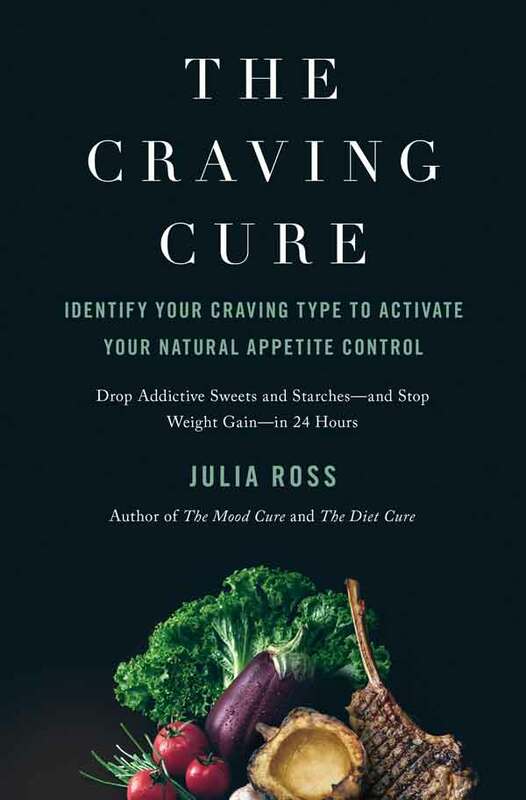 With The Craving Cure, Julia grants all of us access to this revolutionary brain jumpstart program. Beginning with a 5-part questionnaire, Julia’s clear explanations of why and how to use the aminos empower you to reclaim your natural appetite control, and her anti-craving eating guidelines will permanently strengthen your dietary defenses. A well-researched and clinically-tested rejection of low-calorie, low-saturated fat, and low-protein diets, The Craving Cure reveals how we can effortlessly and permanently eradicate our cravings to lose weight, rediscover our nutritional heritage, and regain optimal mood, energy, and health. Readers who have benefited from The Craving Cure approach. Do you want freedom from your cravings?? I am a practitioner trained by Julia Ross at her NeuroNutrient Therapy Institute as well as a former client whose life was remarkably saved from an eating disorder by using every aspect of what Julia outlines in this book. This can literally be a life-saving book for someone! The Craving Cure is a must have for any holistic health care practitioner who wants to elevate their client/patient results and compliance. The Craving Cure is also for any individual who has suffered from cravings, weight gain, eating disorder and diet failure time and time again. This book defines why you have endless cravings and weight issues and gives you a proven and long lasting solution to freedom so you can live the life you were designed to live. Julia has a remarkable way of writing to every person who will read this book. She provides insight, hope, and a solution. Don’t delay in getting The Craving Cure! This book will change your life! I also love that she is not trying to sell you anything I got this book from the library and after rechecking it out 3 times decided to buy it. The advice in this book totally works. We started taking the aminos we discovered we needed based on the questionnaires and outlined in detail in this book and our cravings totally stopped within 24 hours. Not only that but including following the diet advice we have overcome addictions, chronic fatigue, depression anxiety and so many other issues we had no idea were related to our cravings issue. truly a remarkable book. I also love that she is not trying to sell you anything. you can buy the recommended aminos and vitamins in any pharmacy or grocery store. BUY this book! This book will change your life and everything you know about what is ‘healthy! This book has completely changed my life and that of my nine-year-old daughter. Last year she was diagnosed with a food (sugar) addiction, and our pediatrician threatened to put her on a medical weight loss diet if we ‘didn’t control it.’ This book and Ms. Ross’ amino acid therapy has transformed my daughter’s level of happiness, self-esteem, and her chosen eating habits. Now sweets are too sweet and her weight is adjusting naturally – NO DIETING!! I did the protocol with her so I can attest to how well it works. I too struggled with disordered eating, and for the first time in my life, food doesn’t control me. God Bless you Ms. Ross and thank you for helping my family. You’ve transformed our lives and I will always be grateful to you. • It’s not in your mind. You’re not an uncontrollable emotional mess who should just get it together. Most of us now find it impossible to consistently eat well, feel well, or look our best. • It’s not your will power. More than 70 percent of Americans (230 million adults) are now unwillingly overweight, despite their repeated and heroic attempts to change the way they eat. • It’s not a character flaw and you aren’t lazy. In fact, you’ve probably been trying anything that might work for years. Since the onset of the weight-gain epidemic more than fifty years ago, thousands of experts have dispensed advice, some of it very good, about how to eat, think, feel, exercise, or meditate to cope with what has now become a worldwide public health crisis. Yet the increasingly frantic public has found that, year after year, the new approaches never quite solve the problem. Why? Because none of these approaches has ever addressed it. The problem is not that we’re misinformed, mindless, or undisciplined. The problem is that we belong to a nation of cravers—involuntary consumers of the most addictive substances ever known. Only if our cravings for these substances are silenced can we return to our former eating habits—the ones that, until just a few decades ago, had kept us fit throughout human history. How would I know? I’ve been a specialist in eating disorders, addiction, and nutrition for more than thirty years, directing programs specifically for food cravers in the San Francisco Bay Area since 1983 and training health practitioners from around the world since 2004. • Healthy eating and healthy weight are our birthright. They were a given throughout human history until the 1970s. • In the 1970s, several dietary changes, unprecedented in all of human history, radically altered our relationship to food and to our bodies. • Commercially designed food-like substances are turning us into helpless cravers and overconsumers of the most caloric and least nutritious diet ever known; a diet that nature never intended us to eat. • Our brain’s five primary appetite-control forces, including brain neurotransmitters like serotonin and endorphin, have been hijacked by our new eating habits and need an emergency rescue operation. • Each of us has a unique food craving profile determined by the functioning or malfunctioning of our brains’ five appetite-control forces. • Special, brain-targeted nutrient supplements called amino acids can be used to form an immediate line of defense against cravings by directly supporting any of the appetite-control forces that have been compromised. • A twenty-first-century eating strategy that restores the ancient nutritional fundamentals can build in permanent protection from modern dietary dangers, once the amino acids have done their work. Food cravings come in all sizes and strengths, from the vision of chocolate that lingers for hours until we finally succumb, to the unstoppable drive-to-the-store-and-eat-it-all-in-the-car variety. Cravings have nothing to do with real hunger or the need for nourishment. They are blind, brain-triggered drives for a chemical “fix” that only carefully constructed high-calorie, drug-like foods, the bombs, can temporarily supply. Cravings were not our problem until just a few decades ago. Then, in the 1970s, we made three reckless dietary shifts that have since catapulted us into an international weight-gain spiral and set in motion the greatest nutritional crisis of all-time. This crisis is propelled by the endless procession of increasingly sophisticated confections. All of them are scrumptious, but they are not foods. They are specifically formulated to create explosive cravings at the expense of our health and weight. Not understanding the distinction between real foods and drug foods will certainly keep you from losing unneeded weight. It could also kill you. The rates of diabetes and other diet-related diseases are rising in direct parallel with our intake of food-like products that are simply unsafe for human consumption—but impossible to pass up. Part I of The Craving Cure explains how and why most of us have become overweight, sick, and riddled with cravings. But its value is limited if all you can think about is a Snickers. That’s why Part II takes you right to the actual site of the problem. That problem is not located at your waistline or in your taste buds. That problem is in your brain. This powerful organ, which is supposed to be controlling your appetite, has been turned against you. Time to call in a neurologist? Not at all. The repair work needed to get your brain back in gear is a do-it-yourself project. By taking the Craving-Type Questionnaire that follows this introduction, you will quickly discover which of the five types of brain-generated cravings you have. Then, you’ll read the chapters in Part II that apply to any of the Craving Types specific to you. In Part III, you will learn how to make simple but potent nutritional repairs tailored to your own brain’s needs. Once you’ve started taking the nutrient supplements called amino acids that are indicated for your Craving Type, you’ll start experiencing life without cravings, overeating, or weight gain, on the first day. Our clients, thousands of them over the past thirty years, typically call in with the same one-word report after their first day on their brain-targeted nutrients: “Amazing! My cravings have disappeared.” It soon becomes evident that their weight gain is disappearing, too, often as much as ten pounds in the first two weeks, and after that at a steady, sustainable clip. Without cravings, Part IVs Craving-Free Eating options (including one specifically for diabetics) are easy to implement. You have very little to lose but everything to gain. Except weight and disease. An amino acid is a protein. There are twenty of them. We get lots from high protein foods like steak and eggs and some, but fewer amino acids from nuts, beans, and grains. Junk foods contain almost none. Amino acids are called “the building blocks of protein” because they are used alone or in hundreds of combinations, like multicolored bricks, to build every structure in the body, including the brain cells that control our appetites. None of our brain’s appetite-regulating cells can function well without a good supply of at least five of the twenty aminos. The better the amino supply, the more satisfied we feel. The more depleted the amino supply, the more we crave. Most of the five key aminos are readily available as inexpensive individual supplements that start working in minutes. This may all sound very intriguing, but after so many diet experts have made you promises they could not keep, why should you believe me? 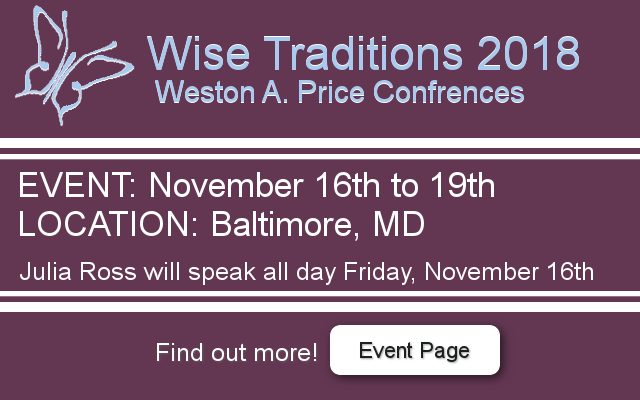 I have been directing programs in the eating disorders and addiction fields since 1980. From the beginning, my programs provided all of the best conventional recovery strategies. But, much to the disappointment of all of us in these fields, they most often failed. That is why I began experimenting with nutritional strategies. Over 4,000 overeater and bulimic clients have since come to my clinic and benefited dramatically from these strategies. As a result, I am now one of a small group of world experts in the field of applied neuro-nutrition; the care and feeding of the powerful brain neurotransmitters that control how we feel emotionally as well as what we crave. As this point, after all my experiences with the clients in my clinic and the successful case reports of hundreds of health practitioners who’ve gone through my trainings, I can honestly say that the strategies in this book are virtually fail-proof. Although I’d begun to be aware of the new research on addiction and the brain when it first emerged in the early 1980s, it wasn’t till 1985 that I was introduced to several studies authored by Kenneth Blum, Ph.D., one of the leaders among the neuroscientists focusing on addiction research. He had documented a brain-targeted nutrient treatment process that seemed to be able to heal the addicted brain using a few individual amino acids from which the brain could make its powerful appetite- and pleasure-generating neurotransmitters. When the targeted brain sites were supplied with supplements of these particular amino acids, his study subjects, all addicted to either alcohol or cocaine, consistently experienced relief of the cravings and negative moods that had always lead them back into their addictions. I asked the nutritionist at my clinic to implement a pilot study of Dr. Blum’s amino acid approach and we found it to be just as effective as we had hoped. So we began to try it in our new program for overeaters and bulimics. The results were nothing short of miraculous. Eventually, we started trialing the amino acids during our very first sessions with these clients—and saw their food cravings disappear even before they walked out the door. Their supplements had helped eradicate their cravings even before they had made any dietary changes. In fact, we don’t let our clients change their diets until their cravings, the ones that have defeated their every prior attempt, are gone. But wait. You’ve been told that quick fixes, silver bullets, and easy answers don’t exist. Only hard work, mindfulness, constant vigilance, portion control, calorie control, fat control, carbohydrate control, or meat control will solve the greatest dietary crisis of all time, right? Wrong. It is true, of course, that you will have to change your eating habits. But after just twenty-four hours on the right amino supplements, you’ll want to. You won’t be craving junk foods, so not eating them will be easy. You will be eating more protein (which is composed of amino acids) and more traditional saturated fats (which, happy surprise, are not weight-promoting or heart threatening, as you’ll learn in Chapter 3) as well as traditional carbohydrates (depending on your tolerance). You’ll also be eating more calories than you would imagine. In other words, you’ll be eating the diet of normal-weight people everywhere before 1970. Though undeniably amazing, the amino acids are intended only to make us feel satisfied with the traditional foods that our normal-weight ancestors enjoyed for so long. 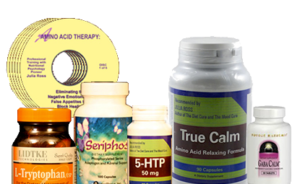 Typically, after two to twelve months, our clients can dispense with the amino supplements altogether. By then they’re relying solely on the aminos they get from their anti-craving foods, bolstered by the secret wisdom of the “three squares” and other nearly extinct but essential traditional eating practices. The recipes and menus section will come in handy here. What you will not find in The Craving Cure is a low-calorie, low-fat, or low-protein diet. Every chapter of this book is aimed at helping you to eliminate highly addictive, industrially designed edibles from your life. But don’t expect to live with feelings of deprivation. It would never work! Once on your program of amino acids and anti-craving foods, you’ll feel fine without the old treats. Without them, the rich supply of nutrients in your now consistently wholesome cuisine will work to restore your health and allow your body to reveal its true weight. The Craving Cure is the key that can return you to your birthright: your natural appetite, your natural health, and your natural shape. I hope that you’ll turn this key in the lock and come home. Take the first step by turning the page and filling out the Craving-Type Questionnaire that will open the way to your craving-free life. 6. Are You a Type 1 Depressed Craver? 7. Are You a Type 2 Crashed Craver? 8. Are You a Type 3 Comfort Craver? 9. Are You a Type 4 Stressed Craver? 10. Are You a Type 5 Fatigued Craver? © 2017 Julia Ross. All rights reserved. Scroll through the tablet to read the introduction and to see the table of contents. The Craving Cure process begins with a 5-part questionnaire that helps you identify your unique craving profile and specifies the amino acid supplements you need to curb your specific cravings. The following is adapted from the book. Need help customizing the suggestions found in Julia’s books? With tailored plans that nutritionally balance the brain’s appetite chemistry based on The Craving Cure , over 90% of Julia’s clients lose their cravings within a day.